The days of boring ceiling light fixtures are gone. 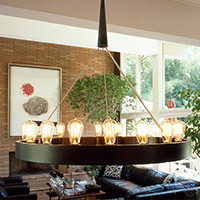 Today’s modern ceiling lights come in an impressive array of options that are suited to both indoor and outdoor spaces. No longer limited to minimalist flush mounts, today’s ceiling lights range from sleek single-light pendants to bold industrial-style flushmounts. In addition, formal and informal chandeliers, linear suspensions, and pendants are also a part of the ceiling light category of fixtures. Ceiling light fixtures are one of the most versatile light fixtures available because they are adaptable to a variety of spaces. Typically, ceiling lights are ideal for rooms that benefit from bright overhead lighting such as kitchens, dining areas, and conference rooms. 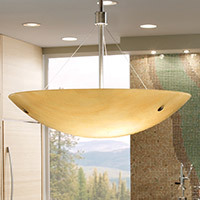 Additionally, bathrooms are a great place to install a ceiling light for concentrated task lighting. Industrial and minimalist fixtures work well in workshops and craft rooms. The right ceiling fixture can be just the finishing touch you need to take a room from average to amazing. When choosing a ceiling light for your space, you should not only consider the décor of the space but also your personal style. 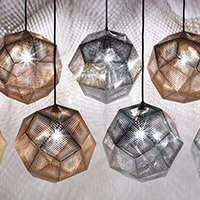 Stunning fixtures are available from several iconic lighting manufacturers and designers, including Jonathan Adler, Kichler, and Artemide. The unmatched lighting options you’ll find here means that no matter what look you’re going for, you’re sure to find the perfect fixture. Iconic celling lightning choices include ceiling flushmounts with frosted glass shades that give off soft ambient lighting as well as statement-making LED fixtures with ultramodern shade designs. You’ll have access to an unparalleled selection of contemporary ceiling lights that are sure to make a breathtaking statement in your home. From chandeliers and suspensions by Visual Comfort to elegant ceiling lights by Feiss Lighting, the possibilities are almost endless. When you first start your search for a ceiling light, the number of choices can be quite overwhelming. You will be presented with a range of choices with literally hundreds of sizes, illumination levels, finishes, and installation options. Brushed nickel, antique brass, and weathered iron are the kinds of finishes you can expect to find in modern ceiling fixtures. These finishes are often combined with glass shades that are treated in various ways that affect how light is cast. For example, ceiling lights with patterned, frosted glass shades provide bright LED lighting while casting eye-catching patterns on surrounding surfaces. 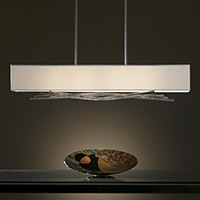 Begin your selection process by understanding which kind of ceiling lighting you need. Chandeliers & Linear Suspension: decorative fixtures meant to be put on display over dining tables, in grand entryways or in the foyer. Modern chandeliers are available in linear (rectangular) designs, crystal designs, Sputnik-style lights, miniature options and more. 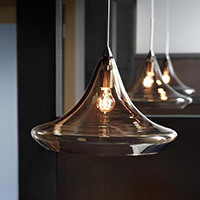 Pendant Lighting: similar in design to chandeliers, pendant lights hang a little lower from the ceiling and can be used on their own or in clusters, and find applications in a number of rooms. 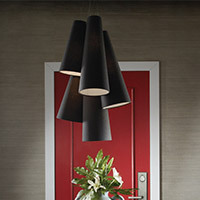 Contemporary pendants are offered in multiple sizes, shapes, colors and finishes, all to match your interior decorating. 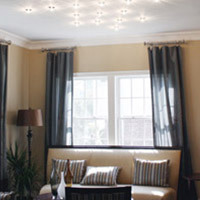 Close-to-Ceiling Lights: flush or semi-flush ceiling lights are best for rooms with low hanging ceilings where a common chandelier or pendant simply will not work. These fixtures mount directly to the ceiling without much (or any) suspension. 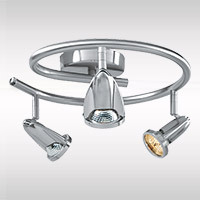 Track & Monorail Lighting: a decidedely archictural look can be found with track and monorail fixtures. 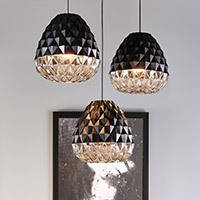 Using directional spotlights or a string of mini pendants, these ceiling fixtures have a modern appearance you'll appreciate for the kitchen, the living room or the home office. Recessed Lighting: recessed or in-ceiling lights install directly inside of the ceiling and provide overhead task lighting. Recessed fixtures are an ideal form of complimentary light and work with pendants, chandeliers, ceiling fans, etc. 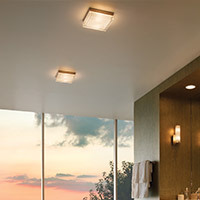 You'll have no problem installing recessed ceiling lights in any room of the home, including in the bathroom. 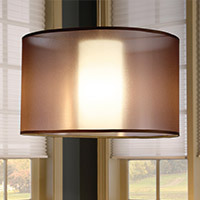 Size is of utmost importance when selecting a ceiling light fixture. 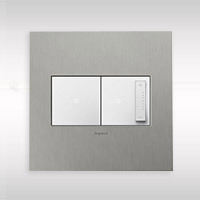 Depending on where you plan to install the fixture, you'll have a variety of options available to you. Begin by thoroughly measuring the area where you are installing or replacing a ceiling light. Keep in mind diameter and height of the light are the two most important dimensions. 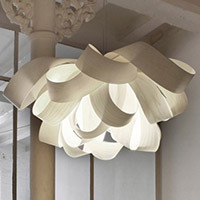 The suspension of the fixture is also dependent on where it is installed. For instance, in living rooms and bedrooms, a good rule of thumb is to keep 7 feet of clearance from the bottom of the fixture to the floor. Be sure to check out our guide on how to choose the right ceiling light size to learn more. 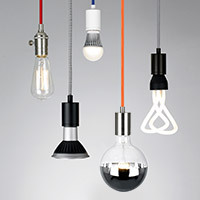 With so many types of lighting options to choose from, you're bound to find just the right fixture for your space. But knowing exactly what fits your space is completely up to you. Do you prefer lighting to stand out from the rest of the room or to blend in with the overall look and feel of the space? Do you like a pop of color to get your guests attention? Or something consistent with the color palette already present in the room? 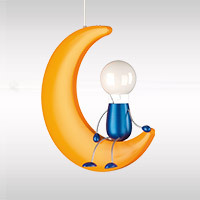 Here you will discover ceiling lights in all colors and finishes, giving you just the right option to fit your mood. Depending on your application, you are able to choose from decorative chandeliers and pendants that suspend far from the ceiling to those fixtures that install perfectly flush with the base of the ceiling, as well as recessed in-ceiling lights. When choosing new ceiling lights for your home, you'll need to be considerate of your installation options, as well as the existing electrical wiring you'll be working with. As always, we recommend consulting with your electrician to discuss any questions or concerns you may have prior to the installation of a new light. 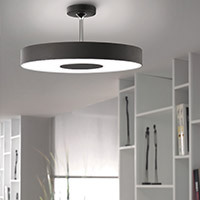 Apart from deciding where you’re going to install your new ceiling light, there are a few other things to keep in mind. Maintenance of the fixture should be considered before purchasing, as some fixtures are more complicated to maintain than others. You will also need to keep in mind that not all ceiling lights are suitable for all spaces. Specifically, sloped ceilings are not ideal for flushmount lighting to pendant lighting, recessed lights, and chandeliers should be used instead. Recessed lighting looks great in spaces like family rooms and bedrooms while track lighting is more suited to kitchens and areas that need concentrated illumination. Also, you may want to install your ceiling light in an outdoor or semi-outdoor space like a patio, so you’ll want to make sure the fixture you choose is suitable for outdoor use. 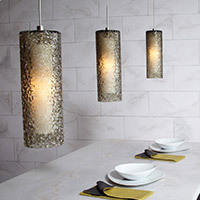 Whether you’re searching for kitchen lighting that makes a statement or looking to swap out an old fixture in your dining room for a modern ceiling lamp, the possibilities are virtually endless. Soft elegance for the contemporary space. The Alt Lucialternative Lilith S Pendant is beauty wrapped in see-through cotton fabric, bright yet gentle illumination emanating from its Satin White bottom glass diffuser. Designed by Studio Alteam. A minimal design for maximum style. 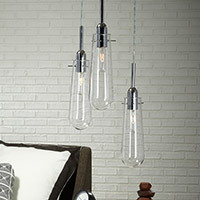 The Sonneman Vogue Pendant floats a classy tapered White etched cased glass shade from delicate aircraft cables and a Black silk covered cord, creating an elegant and inviting glow.